TIMBERS Next Sunday: At 2:30 next Sunday we will have our monthly worship service at Timbers Nursing Home. We have bonded with many of the regulars there, and we need people to help us sing and support the staff and clients. It only takes 30 minutes and it means a lot to everyone at Timbers. 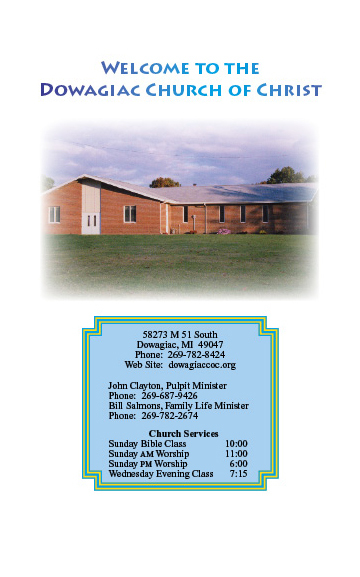 Plan to be a part of this ministry. BUILDING PROBLEMS: We have been meeting with the experts on our foundation problems and will be meeting with another company this week. For a complete report, see THE BACK PAGE below. THANKS to everyone who helped in the funeral of Dave Pickens. Our love for Dave and Donna was obvious to his friends and family. We will miss Dave, but rejoice with Donna in knowing that his pain and struggles are over and he is with the Lord. C. God has all knowledge and total wisdom. Science has learned a small percentage of both. D. Proverbs 8 provides us with amazing insights. I. IS GOD A MAGICIAN OR WIZARD, OR AN ENGINEER? A.	Genesis 1:3 — Did God engineer light or zap it? Psalm 148:5 — God commands, not fakes it. B. God does not call man to blind acceptance. C. God fashioned with purpose. II. PROVERBS 8 DEALS WITH GOD'S METHODS. A. Verse 1 — Wisdom speaks, HER voice. B. Verse 22 — God had wisdom before the creation. ....2 Timothy 1:9; Titus 1:2 — note: before the beginning of time — Proverbs 8:23. C. Science has verified this — quantum mechanics. A. Proverbs 8:24 — Oceans were produced. B. Verse 25 — Mountains have roots, hills are different. C. Verse 26 — Dust and earth are made (asah). D. Verses 27 – 28 — Clouds are important — water system. E. Verse 29 — Land has foundations, oceans bounded. F. Verses 30 – 31 — Humans are marvelous creatures. B. Much science is stated way ahead of its discovery. C. Genesis 2:3 — Miracles and engineering are both used. Since your editor of this bulletin was in Arkansas in a lectureship last weekend, we are a little behind what has happened on the building problems. Richard Hoyt, Bill Gibson and Karl Marcussen have all been working on this project, and a lot has happened. Everyone needs to be informed about what is going on and what our options are. Cynthia and I have been calling every contractor in the phone book (literally) and virtually no contractors are willing to tackle this kind of problem. Nine years ago a drainage system was put in incorrectly and it is going to have to be ripped out and a new system put in so that we do not have a repeat of water eroding sand out from under the foundation and causing the building to sink and cracks to develop in the walls which could lead to a possible collapse. The first thing that has to be done is that the building has to be supported. That involves putting steel poles deep into the ground that can jack up the building and hold it firm. We have already gotten one estimate for that which will be $18,500. The cost of putting in a new drainage system, including ripping out the old one along with the pumps is $12,837.00. This is a different company and involves controlling the water, not putting in the steel poles. By the time we put in other surface things the total cost of the project will be over $32,000. We have another company giving us an estimate this coming Wednesday at 1:00; but this type of work is done by only a few companies and so we do not expect a lot of change in the cost. We do not have any realistic options. Even the companies that do not do this type of work have told us that the steel poles and doing the water control is our only option. If we are going to stay on this property and use this facility we are going to have to do this. We have just enough money in savings, the checking account, and the fund we were building up to hire a full-time preacher to pay for the work without borrowing money to do it. The only other possibility is to sell the property and secure a facility somewhere else. There are several problems with that option, and some of them are not financial. We have some momentum in the community, and people know us as the Church of Christ on M51. Moving loses all of that gain and the good relationships we have in the neighborhood. The three men who have spent a huge amount of time and energy to work on fixing this problem are who you need to see if you have questions. We all need to be informed as to what we have to do and why, and it is important to be united in what we do. This decision needs to be made right away — before winter sets in.